Ellyn Hamm, a graduating senior in music therapy, and her faculty mentor, Professor Andrea Cevasco, have worked together on a project that combines research and service. Their work documents the needs of new born babies in the intensive care unit of the local hospital, provides immediate care and attention to those infants through music therapy while they are in the hospital, and then through an exciting innovation offers recorded music to continue the helpful therapy available in the hospital for the children when they and their parents return to their homes. “During the Fall 2009 semester, I took ‘Psychology of Music’, a class all music therapy majors are required to take. This class introduces students to understanding and conducting research in music. While I enjoyed this class, I never thought I would conduct my own research. But, the next summer my professor, Dr. Andrea Cevasco, asked me to help her provide music therapy to the premature infants in our local hospital’s neonatal intensive care unit (NICU). I was amazed by how just fifteen minutes of music therapy could improve the infants’ behavior state and physiological responses. During the summer I learned how to provide live singing with very simple guitar accompaniment for infants as young as 27 weeks gestational age (weighing 2 pounds) through full-term infants who are 40 weeks gestational age. During fall 2010, Dr. Cevasco, another student, and I compiled all the data we had collected over multiple semesters to examine the effects of live music on these infants. While working with the infants was exciting, the input of all the data into an Excel spreadsheet was tedious and time consuming. But it is important. 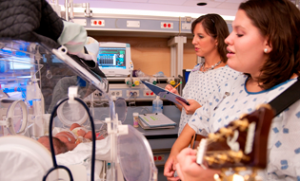 Our results provide information that will help the profession of music therapy develop protocols regarding music therapy in the NICU. We presented this information at the American Music Therapy Association’s national conference in 2010, and we have submitted a research paper, “Effects of Live Singing on Premature Infants’ Physiological Parameters” to The Journal of Music Therapy where it is being reviewed for publication. While working at the hospital, I learned a lot about premature and low-birth weight infants. According to the 2009 Kids Count Data, Tuscaloosa County ranks 48th in Alabama with children born at low birth weight. In addition, all of the counties surrounding Tuscaloosa, excluding Walker and Jefferson counties, are among Alabama’s 17 worst counties for infants born at low birth weight. All of these counties are served by one major public hospital system, DCH Health System, and the Northport Medical Center and DCH Regional Medical Center are the only two locations equipped to handle these fragile infants. In addition to the medical struggles premature infants face in the hospital, these infants have an increased risk of cerebral palsy, intellectual and developmental disabilities (mental retardation), learning disabilities, and behavior disabilities. Many of the premature infants born at DCH, whose families live in the counties surrounding Tuscaloosa, are born into families with higher social risk. According to the 2009 Alabama Kids Count Data, both Greene and Hale counties are in the bottom 17 counties in Alabama for the most children living in poverty, and many of these parents can’t afford to take time off from work in order to drive their children to Tuscaloosa for services. All of these statistics, along with my experiences in the NICU, lead me to develop my project and obtain funding for it. My project is called ‘Baby Beats.’ It is a CD that provides the parents with a cost effective, easy early intervention tool to use with their infant. The CD is organized in such a manner that parents can easily learn how to use it. Within the CD cover is a booklet of simple activities for the parents to implement with their infant to continue to promote parent-infant bonding. The CD as well as the booklet is structured for long-term use, with developmentally appropriate activities to use as their infant grows. It is possible that this CD might fill a void that many of these children are missing once they leave the hospital. Because of my experience with research, I am interested in finding out if parents believe the CD is useful. Two to three weeks after the infant has been discharged, I am asking parents to complete a questionnaire. This includes a series of questions regarding how parents rate the importance of “Baby Beats” to their infant’s development, how much it assists with parent-infant bonding, how often they use it with their infant, and how the infant responds to the CD. Also of importance is whether the parents sing with and without the CD as well as if this has motivated them to sing or use other types of music with their infant.